6pm, Friday 8th July at the BNZ Centre, 120 Hereford Street, next to Scorpio Bookstore. – 11 July 2016: In Conversation – Haruhiko Sameshima, Mark Adams, Tim J. Veling, Hannah Wilson. Following the discussion there will be a film screening of ‘Pictures on Paper – Photobooks in New Zealand’ produced by Tangent NZ Photography Collective. To join the In Situ Photo Project mailing list and keep up-to-date with current events, please visit ispp.nz or their facebook page. 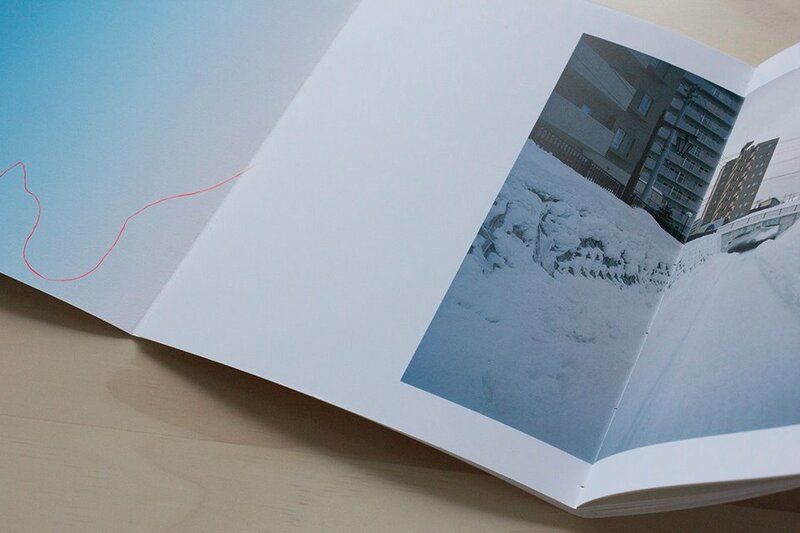 ‘Open Book’ consists of twelve new photobook works, created specifically for exhibition. Its premise is to provoke artists’ experimentation with the book form and to position the book as a gallery experience. Each artist has been given autonomy to pursue and realise a project of their individual interest, as relevant to their current practice. The collective result of these endeavours is a compact exhibition: each artist’s work is folded in on itself or cut and stacked, the content largely hidden from view. To experience it, you are invited to open a book. Reflecting back on the last quarter century, so much has seemingly changed, happened. Technologies emerged that fundamentally altered the way we do things, the methods by which we gather and disseminate information, and how we communicate. This last quarter century is also notable for the technological restructuring of photography by digital processes that now dominate the industry (Photoshop 1.0 was launched 19 February 1990). Less perceptible, but perhaps more important, are shifts in values attached to things and ideas, like the value of art, education, institutions, their ideologies. This exhibition samples images from recent projects by photographers who have graduated over the past 25 years from New Zealand tertiary art education, and who majored in the specialist medium of photography. All photographs were made with analogue film technology and loosely fall into the field of extended ‘documentary’, with subjects carefully sought from specific environments of the photographers’ choosing. The selection is not an attempt to suggest a collective attitude, or a stylistic manifesto. Nor is this an attempt to weave a larger narrative using the threads of individual pursuits. It was based on a question why such a seeming anachronism as film photography is still consistently used by a diverse range of graduates from different New Zealand art schools and over such a long period. ‘Selective Exposure’ includes photographs by Caryline Boreham, Conor Clarke, Peter Evans, Shelley Jacobson, Julius Margan, Asumi Mizuo, Solomon Mortimer, Stephen Roucher, Shigero Takato, Tim J Veling. The exhibition is supported by a grant from Creative New Zealand, and Rim Books is a sponsor. Shortlisted along with books by Allen Curnow, Dennis McEldowney, Margaret Mahy (with Jill McDonald), and Gordon H Brown, Gregory O’Brien give the thumbs up to Haru Sameshima’s Bold Centuries in his list of five New Zealand classic books worthy of more attention. Bold Centuries: A Photographic History Album, was published by the photographer himself, with assistance from Creative New Zealand and also PhotoForum. This remarkable book, packed with a huge variety of images relating to ecotourism, the subject of Sameshima’s university study, also included essays by Kyra Macfarlane, Ingrid Horrocks, John Wilson, Tim Corbalis, Aaron Lister, Damian Skinner, Fiona Amundsen and Claudia Bell. A pdf showing a few pages from the 196 page book can be seen here. Copies are still available from Rim Books, www.rimbooks.com at $60 plus post and packaging in NZ. UPDATE: The Engine Room is presenting a critical response of Haruhiko Sameshima’s exhibition ‘A nostalgia for modernity’ by photographer and academic staff member of Whiti o Rehua School of Art, David Cook. Monday 31st March 12.15 – 12.45 pm All welcome. Opens Friday 21 March 5.30pm. Haruhiko Sameshima, a full time artist and freelance photographer based in Auckland, has exhibited widely in solo and group shows throughout New Zealand since 1982. His photographic practice focuses on the idea of tourism and tourist sites as expressions of identity where the packaging of environment – such as architecture, museum displays, man-made landscapes and advertising billboards – are a principal focus. Edited by Jenny Gillam & Dieneke Jansen, the book includes projects by Tanya Eccleston and Monique Redmond working as the Suburban Floral Association, Amanda Yates, Gillam & Jansen, as well as texts by Lara Strongman, Kate Linzey, Andrew Douglas and Sue Gallagher. With foreword by Mark Amery. The publication will be for sale at the discounted cash price of $20. They ‘…are privileged objects of the imagination not because they are the most beautiful but because they are the most imaginable.’ . From its beginning photography has engaged with science and developed a special relationship with flower motifs. Images of the great variety of different plant and flower species serve as a ‘substitute’ for the traditional herbarium. Photographers’ frame our indigenous and exotic botanical world, depicting isolated specimens or plant groupings, both arranged and in the natural environment. Repeating themes are formalism, repetition, lyricism, symbolism and metaphor; including subjects anthropomorphized through photography, and traditional notions associated with the flower as a marker for the transience, ambivalence and beauty of human existence. Expanding this aspect ‘…the uncompromised beauty of the flowers, which never perishes, their concept and identity as objects of beauty remain intact, eternal, despite their imminent fate.’ . In this changing world, our physical co-dependence on plants, and their environment, is becoming increasingly evident; emphasizing the connectedness of all things.